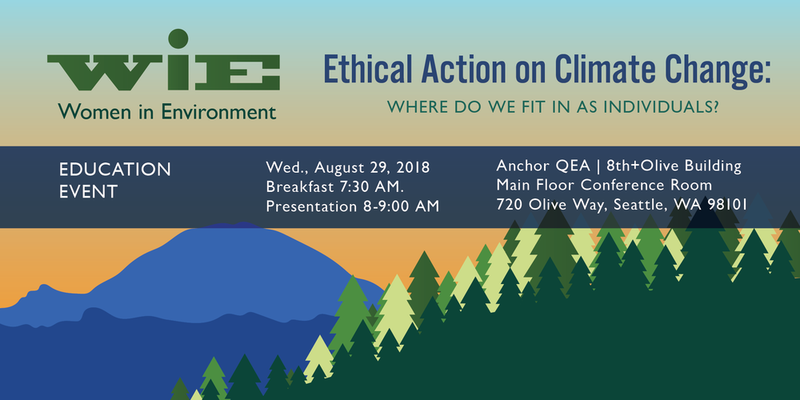 Ethical Action on Climate Change: Where Do We Fit As Individuals? On August 29th, WIE Seattle welcomes Lauren Hartzell Nichols, an affiliate assistant professor in the philosophy department at the University of Washington. She is published widely on ethics and climate change with a focus on how we should make ethical decisions in the face of the significant intergenerational risks. She will speak to us about the challenges of understanding what role individuals should play in addressing climate change. For example, do individuals have an ethical obligation to reduce their greenhouse gas emissions? Or does the responsibility for reducing emissions fall on nation states? During her presentation and subsequent discussion, Lauren will raise more questions than she answers. Her aim is to open up a conversation about the complexity of moral reasoning in the context of climate change. The main floor conference room is located on the first floor, just past the elevators on your right. Thank you to Herrera and AnchorQEA for your generous sponsorship for this event!